A movie comes around every once in a while that tells a tale so astounding, that no one could make it up. Back in 1920’s Japan, a professor at the University of Tokyo, had an Akita pup named Hachiko, that walked with him everyday to the train station. 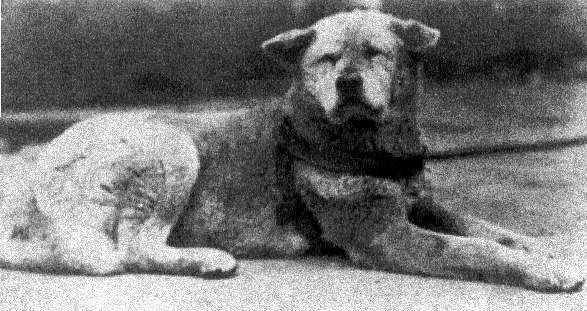 The dog, Hachiko, would then go home, and when 5 o’clock came, he’d be waiting for his master at the station. This continued for a couple of years when , after suffering a fatal cerebral hemorrhage at work, his master did not come home. Hachiko waited and waited. For eight years, he waited. The location is moved from just outside of Tokyo to outside of Bristol, Connecticut. The time is now in the late 90’s through the 2000’s. Hachi is found at the train station after his crate is busted open. These modifications change not one whit the spirit of the film. As Professor Parker Wilson, Richard Gere is open to everything. Hachi is at first a curious surprise, he bonds with the puppy and learns much about his breed in a short time with the help of his friend, Ken (Tagawa). His wife Cate (Allen) is at first nonplussed by the idea, but she comes to accept the dog’s newfound role in your husband’s life. A curious plot device is the attempt by Parker to teach the dog to fetch. He works on this for a considerable amount of time before discovering from Ken that Akitas do not fetch, ‘unless there is a reason to do so.’ This, of course, is prevalent to the plot, but nonetheless a very nice touch. Hachi… (also know abroad as Hachiko) is full of very nice touches. Hallström has not approached a movie with such nuance since What’s Eating Gilbert Grape? And, after the debacle that was Dear John, it had begun to look as if his best days were behind him. Happy to say, this is not true. One of the true gifts to this movie is the sparse amount of dialogue. 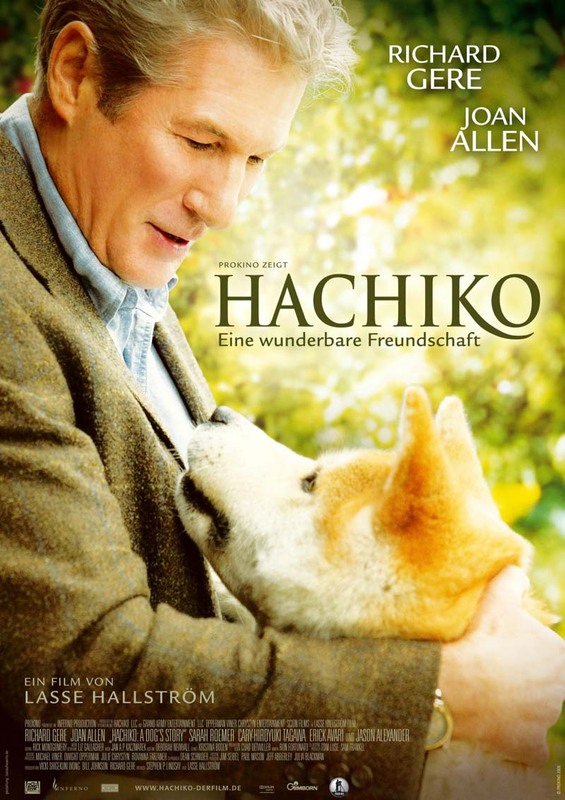 The subtle sounds of the soundtrack, and even silence, pervade through the latter half of the film, adding a poignancy to the plight of all characters, including Hachi. My wife and I struggled to hold back tears the last 20 minutes of the story. It is a classic, but thoroughly exhausting film. Richard Gere has learned a lot in his years in front of the camera. Intriguingly, he has learned to say more while talking less. Hachi finally decides to play fetch. This absolutely lends itself to the strength of the film, preventing cliché from taking over where it normally would in an animal movie. It is obvious the amount of love he has for life in this movie: his wife, his daughter and the dog. The rest of the cast is stellar as well. Joan Allen gives an outstanding performance as a flawed person. Rather than just walk through the motions, she reacts in ways that are at once sad, and quite believable. Jason Alexander is exactly the kind of person you would expect to work a train station in a small town. Happy to help…but not too much. Erick Avari gives a touching performance as a vendor who leads with his heart. His reactions represent, in large part, the reactions of the viewer. He hits a home run with a small part. The most loyal and loving dog. 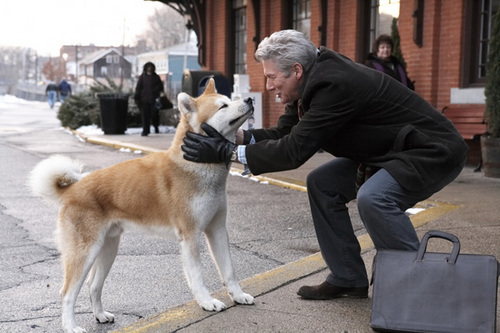 One would be hard pressed to come up with the last movie about an animal that was as good as Hachi: A Dog’s Tale. The Black Stallion is probably the one that comes closest in feeling. Coppola expressed the same confidence there that LasseHallström does here. There are little things in life that we are often too busy to notice. Hallström notices, and through him, so do we. I had a dream about my wife’s cat last night. It was a sad dream, filled with unresolved guilt for times I just looked at him as someone to avoid tripping over in the mornings when I would head downstairs. The dream, no doubt spurred by this movie, made me realize the gifts that small life brought into my world and the affect my life had on his world. 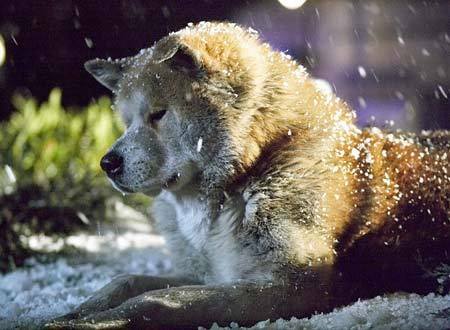 For this reason, Hachiko… is a movie not to be missed, if you like movies about love and loyalty in the face of life’s eternal struggle. Greatest Film oF ALL TIME! I CRIED! No adult in our house could keep their eyes clear of tears, either. Thanks for reading and commenting, my friend. Thanks for your reply Kristin. It was heart-rending for us as well..we just hadn’t expected it to be because the dog lived. Even more tearful that way. A beautiful, beautiful and touching film. A real tear-jerker, but I loved it. Fantastaic. It reminds of my late dog, Lady. One of a kind. a bond that was so strong, with so much love and respect for each other. In my case, I have got more love from Lady and my now dog, Darlin. than from any human being. Its hard for others to understand unless they have had that experience. dog, anyone else would have given him up. Secretariat and Seabiscuit as well, how loved they were. Animals are amazing and bring so much joy into one’s life. Thank you for your story, Carol. Haichi rings true for many people for just that reason. Dogs have a heart like almost no other being. Thank you for reading my site. I hope that you enjoy it. I can’t get enough of the movie and I highly recommended to anyone I know. Darlin with me. She sat on my lap in the wheelchair for 4 hours. Not a word out of her. people to pet. She helps me with my depression, anxiety and panic attacks. she was a single mom living in an apartment with a newborn baby. This movie has touched so many. It is by far my most popular post. Thank you for taking the time to read and to post. I have this DVD, and I must say I loved it and watch it often as I had a dog like him, but admit it was not a Akita dog. And yes I cry.